We return to the boat for a three hour trip to Santa Fe, with lunch on the way, and pull into a tiny lagoon. The sandy bottom and green water reflect the breasts of young frigate birds. Colourful fish come to the galley for leftovers. A turtle breaks the surface and examines us before popping back into the deep again. A puffer fish gets caught in the ship’s pipe, so the electricity has to be cut off to remove it. The scene reminds me of Turtle Bay in Kenya, but here it is less peaceful. Half a dozen boats are anchored, disgorging people to snorkel with sea lions and white-tipped sharks. Dinghies leave their boats one after another, crammed with snorkelled tourists who do the rounds of the rocks: first swimming with sea lions along the craggy shore, then round the sandy beach curve. I swim in a circle round the Guantanamera, the water is smooth and refreshing, then I lounge on deck. A flock of blue-footed boobies fly in, showing their bright blue feet like aircraft landing gear. We have a wet landing in the afternoon, followed by a leisurely two-hour walk against the flow of tourists. I spot a couple of warbler finches, some land iguanas and we pass a 100-year-old cacti with very thick trunks, looking like polished bark. We stop several times to let other groups go by. On the beach again, I try to distinguish between the small and medium finches, which is very difficult unless seen side by side. Sea lions lurk under the bushes, and colourful Galapagos doves peck in the dirt. After supper we notice pictures of floods on the TV, which is all in Spanish, and the crew talk of an earthquake; I wonder how an earthquake can be linked with floods, but don’t take much notice. We retire early as the boat swings into gear for Espanola. This time, it isn’t as rough as I feared. We awake in an idyllic bay – emerald green waters, a rock, and a long sandy beach – and disembark for three hours of individual wandering between the STOP signs on the fine sand. There are a few sea lions. Curious Hood mockingbirds are intrusive in their behaviour. (Hood was the previous name for this island). Desperate for liquid, they edge up close when I open my water bottle and make it clear they want to share. One jumps onto my hand. But we are not allowed to oblige, Billie warns us, because this will make the birds unnecessarily dependent on people. They have to search for their own water on the cactus plants, as they have always done. A flock of Galapagos doves flies in and a solitary Galapagos hawk waits on a rock. The iguanas here are different again. Fearless ground finches: one hops onto my back as I bend down to examine it closely. I also get very close to a yellow warbler while wandering happily for two hours, then I take to the ocean with snorkel attached. I dont like getting my head and ears wet, and dont go far. A few medium-sized fish swim around sparse outcrops of coral, and I see more turtles poking their heads up from the sea. 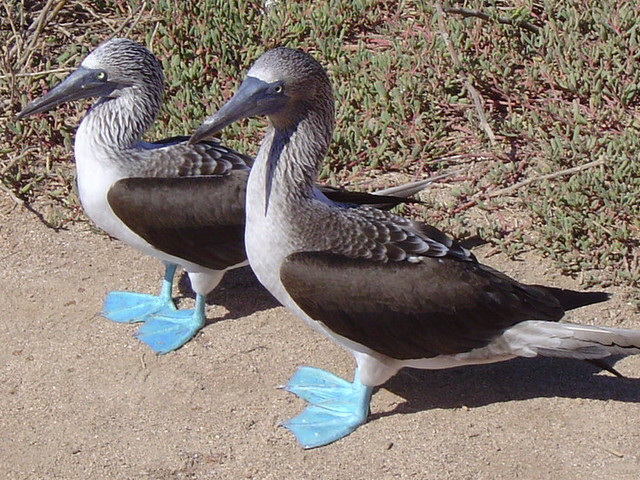 This entry was posted in Travels and tagged blue-footed boobies, earthquake, Espanola, floods, frigate birds, Galapagos, Hood mockingbirds, Santa Fe, Turtle Bay, turtles. Bookmark the permalink.